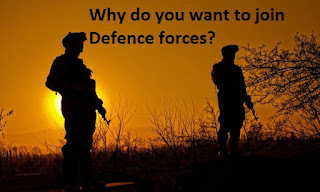 Home / FAQ / how to crack ssb interview / SSB Interview / ssbinterview / Why do you want to join Defence forces? Why do you want to join Defence forces? *Don't say you want to join for Job security,you are going to join defence forces to serves the Nation, not to get the security. The status, the respect an Armed Force Personnel gets cannot be purchased, it has to be earned. One is respected for the years to come after martyrdom. The only organisation where you have continuous mental (higher education and various technical training) and physical growth (sports, team player & rigorous training) which brings the best man out of you. This provides you with the opportunity of having a very adventurous life. 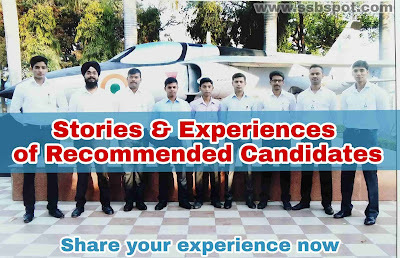 You can go for higher education in prestigious institution like IIM & IIT while being part of Indian armed forces. Armed forces provides you with reasonably well pay & perks along with lifetime medical and post retirement benefits. Be that as it may, all these are too less contrasted with the life you will live , the way of life you will have. Defence force goes that additional mile in helping other under ordinary conditions and does wonder if there should arise an occurrence of cataclysmic event or outer dangers.